If wild animals could participate in the Olympics, the land animals of the wild would outrun any human. 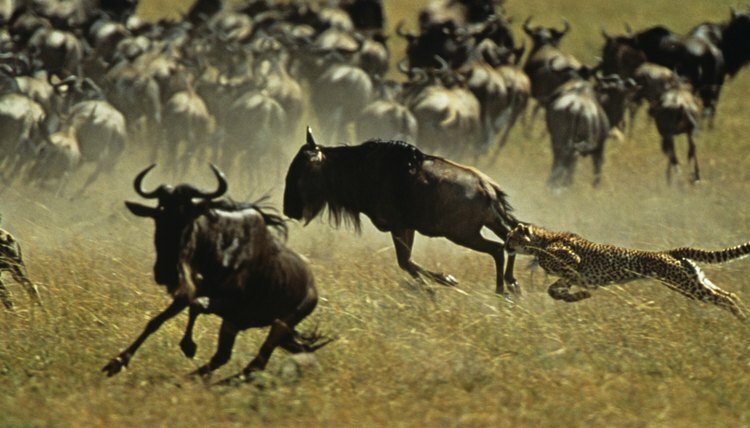 Most animals use their speed when overpowering prey or escaping a predator. The following maximum speed measurements "are based on measurements recorded over approximately quarter-mile distances. Exceptions are the lion, which was clocked in the act of charging, and the cheetah, which was measured over a 100-yard distance," notes the TravelAlmanac.com. 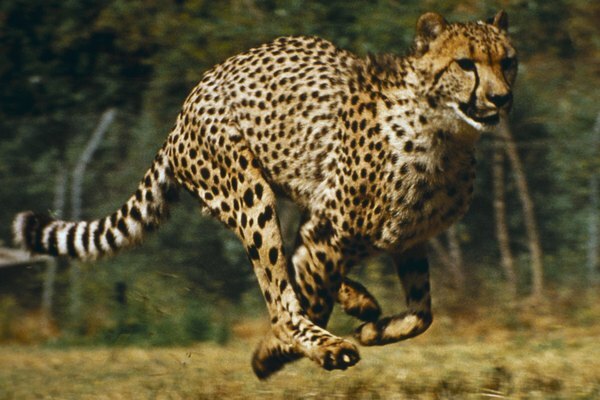 The world's fasted land animal is the cheetah. The cheetah has an "acceleration that would leave most automobiles in the dust; a cheetah can go from 0 to 60 mph in only 3 seconds," according to the National Geographic. This large cat has exceptional eyesight to scan for prey. The sleek and flexible spotted body of a cheetah provides camouflage for dry grasslands in Southern and East Africa, where about 12,000 endangered wild cheetahs exist. For more than a million years, the pronghorn antelope has roamed North America. "The running gait of the pronghorn is beautifully smooth and their powerful legs can carry them at a remarkable pace across the roughest kind of terrain. Pronghorns can reach speeds of 60 mph," notes the National Park Service. 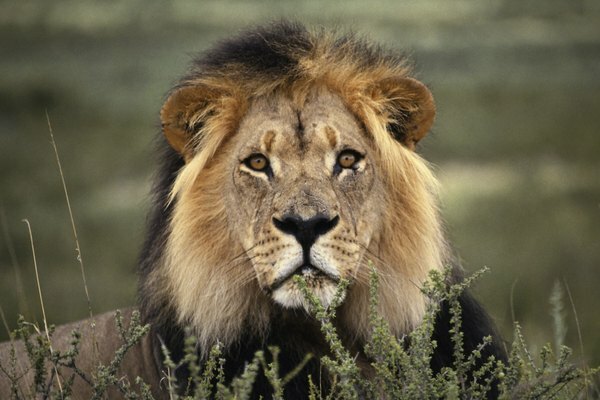 Lions roam grassy plains and open woodlands of the sub-Saharan region. Lions may be as long as 48 inches and weigh up to 500 pounds. When looking for prey the lion can reach speeds as fast as 50 mph. The Thomson's gazelle roams the grasslands and open plains of northern Tanzania and southern Kenya. This gazelle weighs 35 to 55 pounds and is exceptionally alert to sounds and movements, and its fine sense of hearing, sight and smell balances its vulnerability on the open plains, according to the Out to Africa website. The Thomson's gazelle is able to run 50 mph. The wildebeest belongs to the antelope family. The Afrikaans began calling the gnu the wildebeest because it had a shaggy mane, sharp horns, pointed beard and a huge head. 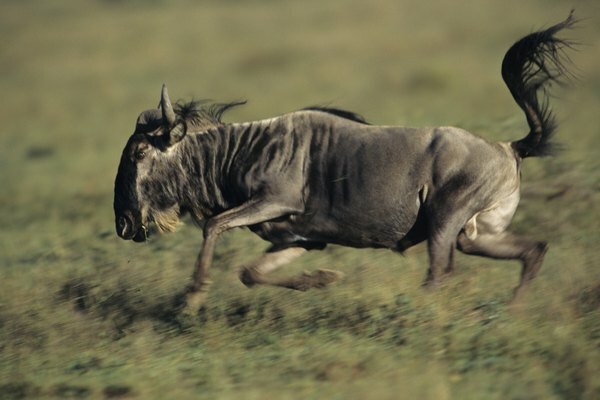 Wildebeest can weigh as much as 600 pounds and run as fast as 50 mph. The wildebeest roams the woodlands and plains of sub-Saharan Africa. 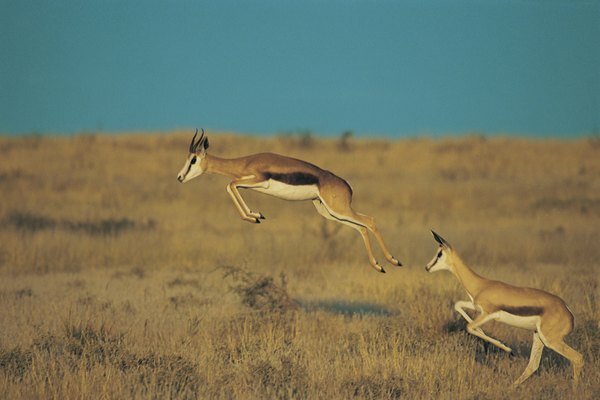 A springbok may reach a speed of 50 mph. 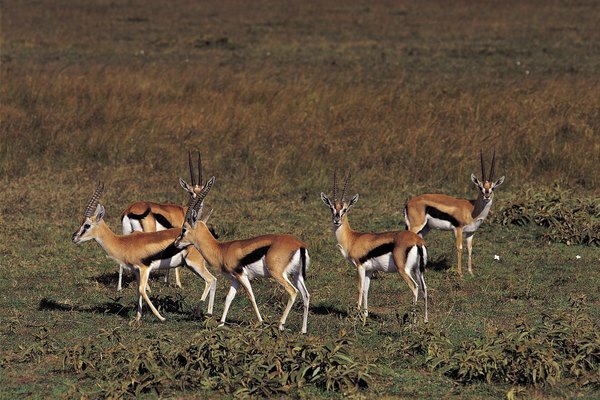 The springbok's main predators consist of leopards, lions, humans and lions. This reddish-brown, small antelope may leap up to 13 feet. This South African animal lives in semiarid and grassland regions. The quarter horse has heavy muscling, a stocky built and a compact appearance. This well-defined horse can sprint 47.5 mph. 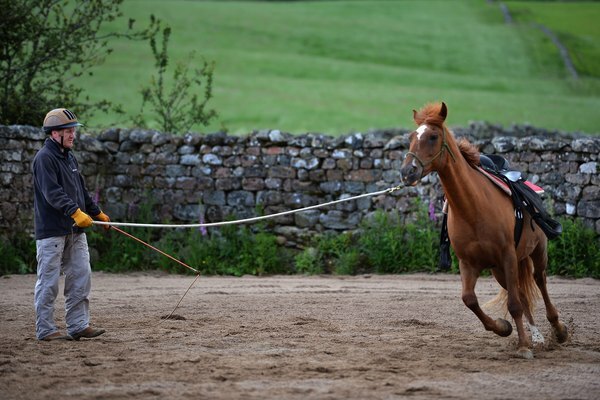 "Quarter horses are quick, balanced and agile. They are collected in action and stand at ease with their legs well under them. They are even-headed, kind, surefooted and steady," notes the Ultimate Horse Site. 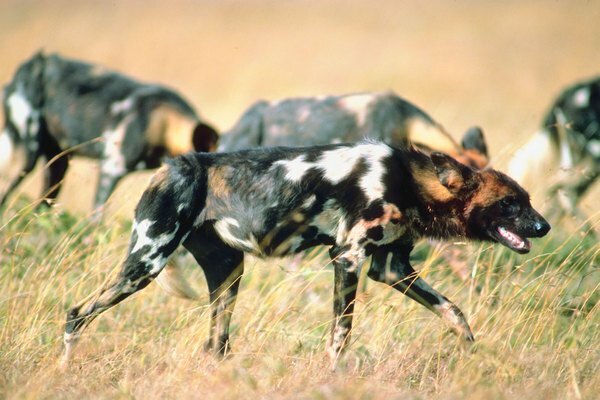 Identified by a distinctive coat of black, red, white and yellow, the Cape hunting dog reaches speeds of 45 mph. The Cape hunting dog travels in pack of six to 20 animals. A pack of these dogs may pursue large prey, such as antelope and wildebeest, especially if injured or sick. 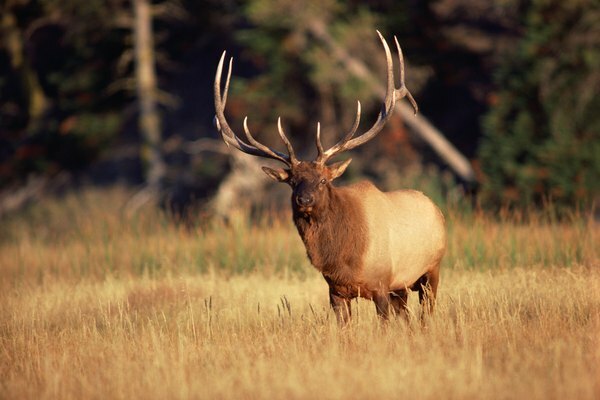 In North America, the elk is the largest deer. The wapiti is another name for the elk, which means "light-colored deer." The elk can go as fast as 45 mph when it needs to avoid danger. The elk is a massive animal; therefore most animals do not bother the elk. An elk's antlers may grow up to 4 feet, making the tip of the animal's horns as high as 9 feet off the ground. The coyote runs up to 40 mph. 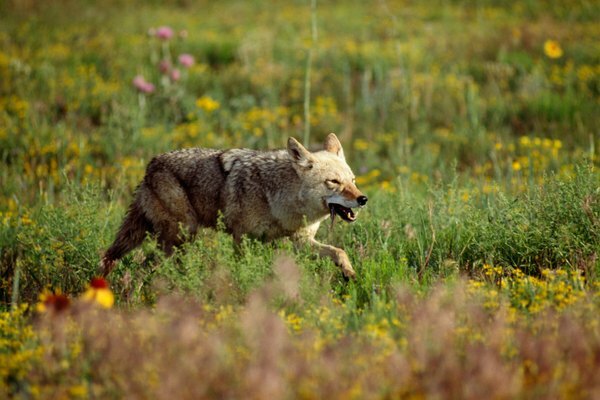 Coyotes are able to adapt to North America's changing landscape. These clever animals eat rodents, fish, frogs, deer and snakes. With their keen sense of smell and strong vision, this member of the dog family typically forms a pack with other coyotes to hunt prey together in the fall and winter months.